Live Nation wants you to enter once for the chance to win a flyaway trip to see Darius Rucker's Good For A Good Time Tour in Virginia Beach, complete with a meet & greet! 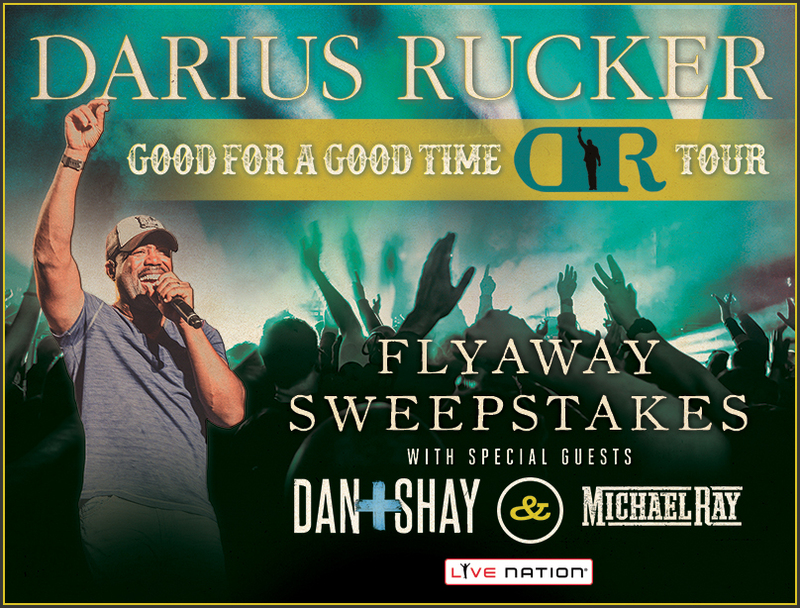 One (1) Grand Prize consisting of a Rock Flight which includes two (2) general admission tickets to see Darius Rucker at Veterans United Home Loans Amphitheater at Virginia Beach in Virginia Beach, VA scheduled to take place on September 9, 2016 to include meet and greet with Darius Rucker; round-trip, coach class air transportation for two (2) from the airport nearest Grand Prize Winner's home within the U.S. or Canada to Virginia Beach, VA departing on September 8, 2016 and returning on September 10, 2016; one (1) double occupancy standard hotel room for two (2) nights / three (3) days; and a 200.00 cash card to use toward ground transportation. Approximate Retail Value of the Grand Prize is: Two Thousand Eight Hundred Thirty Three Dollars ($2833). This Sweepstakes ends on 08/10/16 and you can ENTER ONCE to win.